Internship | Interested in Working with an Outstanding Undergraduate Student? Interested in Working with an Outstanding Undergraduate Student? If so, consider mentoring an undergraduate through the IRIS Summer Internship Program. 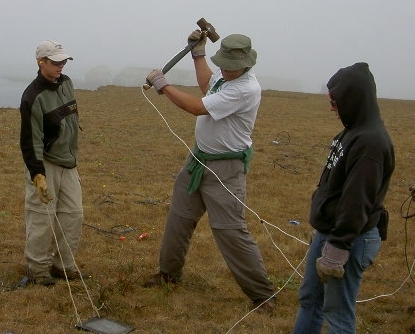 The goal of this exciting program is to provide undergraduates with training and experience in seismological research through the universities and research institutions of the IRIS Consortium. To accomplish this goal principal investigators at IRIS member institutions and their research projects are matched with qualified undergraduate applicants from outside their own institutions. (IRIS will complete the initial matching of potential interns and PIs, however PIs have final approval of all matches.) Students will begin their summer experience with a one-week orientation the last week in May held on the campus of an IRIS member institution. The goal of the orientation period is to develop a strong sense of community among the interns and provide an introduction to some of the most exciting aspects of modern seismology. Interns are expected to present a paper on their summer project at a national geoscience meeting (such as AGU or the annual IRIS workshop) during the academic year following their internship. Projects will be selected based on their educational merit and the match with the interests and qualifications of the undergraduate applicants. PIs with field experiments scheduled for summer or recent PASSCAL PIs with data for students to work with, are particularly encouraged to apply. Mentoring multiple interns at a single institution is encouraged, as we have found placements of small groups of interns to be successful. How many interns are placed each year? The short answer is that it depends. Our program has funding from the National Science Foundation to support 11 interns each summer. However, we have been fortunate enought to be able to expand the number of students that we place through funding provided directly by researchers who "fund" extra slots. This funding comes from a variety of sources including the broader impacts potion of NSF grants, start up money, early-career awards, or REU supplements (short, relatively pain free) that are available to PIs of other NSF awards. The estimated cost per intern is ~$11,000. A benefit of funding a slot is that it also ensures that you receive a student (we always receive a few more mentor applications than we have slots). * We are actively seeking PI's interested in including the IRIS Internship Program in the broader impacts statement of their proposals. To learn more about collaborating to achieve your goals while supporting our program, please contact our program facilitator Michael Hubenthal, hubenth "at" iris.edu. Can I sponsor an internship slot to ensure I get a student? Absolutely! In fact, we count on several PIs providing funding for internship slots each year to help us reach our goal of 15 placements/summer. Funding for such slots could come from the broader impacts potion of your budget, start up money, or you can submit an REU supplements (short, relatively pain free) that are available to PIs of other NSF awards. The estimated cost per intern is ~$11,000. Can I apply for more than one intern? Yes. In fact, we think placing two students at the same institution is a good thing! However, to receive a second intern you must be willing to support the cost of the second intern. Depending on the details of the project and the cost of airfare etc, the estimated cost per intern is ~$11,000. REU Supplements, are available to PIs of other NSF awards, and are good avenues to obtain this funding. The IRIS REU Program can help you submit one. We have moved to this model to better serve the Consortium; each year we receive several more host applications than we have funding to support. To Apply (Application is CLOSED) DEADLINE FEBRUARY 15. If you interested in supporting a student who wants to expand their project into an undergraduate research project or thesis? Step 3: You will be notified by March 15 whether your project has been approved as a potential project. The selection committee works to accept interns that are well suited to the host research programs available. To finalize the pairing, accepted interns are provided with several projects that the selection committee has recommended for them based on the description of the project and the intern’s statement of interest. To make this critical decision, interns are strongly encouraged to work closely with their academic advisor at their home institution. Once students have ranked the proposed research projects, the host for the top choice is sent the student’s application to ensure that the student has the capabilities to succeed in the research project. Students are next connected to their hosts via email to finalize the dates of the internship and to get to know each other. This approach has proven very successful as all hosts since 2003 have agreed or strongly agreed that the selection committee provided them with a well-qualified intern for the summer. At the end of the summer, BOTH the PI and the intern will submit a brief report summarizing their experiences with the program. We also encourage you to work with the intern to have her/him present a paper at a professional meeting during the fall/winter following the internship. As stated above IRIS will cover the costs associated with the intern attending a professional meeting. 6 Steps that you can take to ensure that you and and your intern, have a great productive summer! For more information please contact Michael Hubenthal, Senior Education Specialist, hubenth@iris.edu.